Definition at line 131 of file CLCurve.h. Definition at line 139 of file CLCurve.h. Definition at line 74 of file CLCurve.cpp. Definition at line 79 of file CLCurve.cpp. Definition at line 98 of file CLCurve.cpp. Definition at line 101 of file CLCurve.cpp. Referenced by CCopasiXMLParser::CurveElement::end(), CCopasiSpringLayout::finalizeState(), and CLLayoutRenderer::revert_curve(). Definition at line 106 of file CLCurve.cpp. Calculates the bounding box for the curve. Basepoints for cubic beziers are considered to belong inside the bounding box. Definition at line 218 of file CLCurve.cpp. References CLLineSegment::getBase1(), CLLineSegment::getBase2(), CLLineSegment::getEnd(), getNumCurveSegments(), getSegmentAt(), CLLineSegment::getStart(), CLPoint::getX(), CLPoint::getY(), CLLineSegment::isBezier(), and max. Definition at line 112 of file CLCurve.cpp. Referenced by CCopasiSpringLayout::finalizeState(), and CCopasiXMLParser::CurveElement::start(). Definition at line 148 of file CLCurve.cpp. Referenced by CLMetabReferenceGlyph::exportToSBML(), CLGeneralGlyph::exportToSBML(), and CLReactionGlyph::exportToSBML(). Definition at line 154 of file CLCurve.h. Referenced by CCopasiSpringLayout::addReactionVariables(), CQGLNetworkPainter::createGraph(), CQGLNetworkPainter::drawEdge(), operator<<(), and CCopasiXML::saveCurve(). This method should only be called if isContinuous() is true. It returns the curve as a list of points rather than a list of line segments. Definition at line 130 of file CLCurve.cpp. Referenced by CQGLNetworkPainter::checkCurve(), and fillItemFromCurve(). Definition at line 168 of file CLCurve.h. Referenced by CQLayoutScene::addGlyph(), CCopasiSpringLayout::addReactionVariables(), CLayout::calculateBoundingBox(), calculateBoundingBox(), CQConnectionGraphicsItem::CQConnectionGraphicsItem(), CLLayoutRenderer::draw_curve(), CLLayoutRenderer::draw_layout(), CQGLNetworkPainter::drawEdge(), fillItemFromCurve(), CCopasiSpringLayout::finalizeState(), CLLayoutRenderer::getCurveBoundingBox(), CLLayoutRenderer::getObjectsAt(), CLLayoutRenderer::getObjectsInBoundingBox(), CQConnectionGraphicsItem::getPath(), CLLayoutRenderer::is_curve_visible(), CQGLLayoutPainter::mouseMoveEvent(), CLLayoutRenderer::move_curve_object(), CLLayoutRenderer::move_reaction_glyph(), CLLayoutRenderer::move_selection(), CLLayoutRenderer::move_species_reference_glyph(), moveBy(), compareGraphicalObjectsBySize::operator()(), operator<<(), CLLayoutRenderer::revert_curve(), CCopasiXML::saveCurve(), CCopasiXML::saveLayoutList(), CQGLNetworkPainter::setNodeSize(), CLLayoutRenderer::update_associations(), CQGLLayoutPainter::update_status_and_cursor(), and CLLayoutRenderer::update_textures_and_colors(). Definition at line 156 of file CLCurve.h. Referenced by calculateBoundingBox(), CLLayoutRenderer::draw_curve(), fillItemFromCurve(), CLLayoutRenderer::getCurveBoundingBox(), CLLayoutRenderer::getObjectsAt(), CQConnectionGraphicsItem::getPath(), CLLayoutRenderer::is_curve_visible(), CQGLLayoutPainter::mouseMoveEvent(), CLLayoutRenderer::move_curve_object(), moveBy(), CLLayoutRenderer::revert_curve(), CQGLNetworkPainter::setNodeSize(), CLLayoutRenderer::update_associations(), and CQGLLayoutPainter::update_status_and_cursor(). Definition at line 162 of file CLCurve.h. this method tells whether the curve is a continuous set of line segments, i.e. if the end point of one line segment is identical to the starting point of the following one. Definition at line 117 of file CLCurve.cpp. Referenced by fillItemFromCurve(), and getListOfPoints(). Definition at line 187 of file CLCurve.cpp. 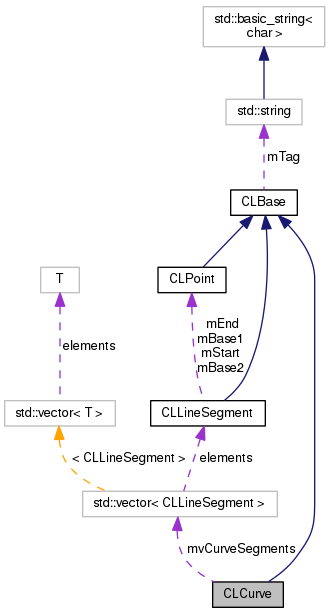 References CLLineSegment::getBase1(), CLLineSegment::getBase2(), CLLineSegment::getEnd(), getNumCurveSegments(), getSegmentAt(), CLLineSegment::getStart(), CLLineSegment::isBezier(), and CLPoint::moveBy(). Definition at line 201 of file CLCurve.h. Definition at line 214 of file CLCurve.h. Definition at line 173 of file CLCurve.cpp. Definition at line 135 of file CLCurve.h. Referenced by addCurveSegment(), CLCurve(), clear(), exportToSBML(), getCurveSegments(), getListOfPoints(), getNumCurveSegments(), getSegmentAt(), CGraphCurve::invertOrderOfPoints(), isContinuous(), operator==(), CGraphCurve::scale(), and scale().